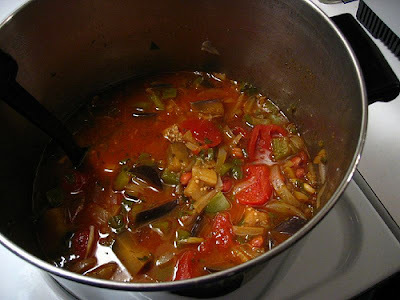 Today I bring you a recipe for a spicy eggplant stew. It’s another imaginative and unusual dish adapted from Jay Solomon's Vegetarian Soup Cuisine. 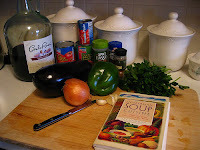 It is low in sodium, high in healthy vegetables and laughably cheap to make (the entire recipe can be made for around $8.00). This is a brand new dish that we made for the first time last week, and it was a big hit in our home. It contains no added salt and it certainly doesn’t need it: the jalapenos add an extra kick to the dish, and the cumin, red wine and fresh parsley make it flavorful and exotic. Best of all, this recipe is easy. In well under an hour you can put yet another healthy meal in front of your family without boring them to death with bland food. Heat oil in a large soup pot. Add onion, eggplant, bell pepper, garlic and chiles. Saute over medium heat for 10 minutes, stirring frequently. Add water, stewed tomatoes, tomato paste, wine and seasonings (everything else but the can of beans). 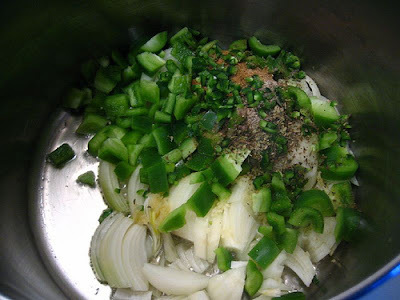 Bring to a boil and simmer for 30 minutes, stirring occasionally. Add beans just a few minutes before the end. Let stand for 10 minutes and serve with optional whole grain bread. 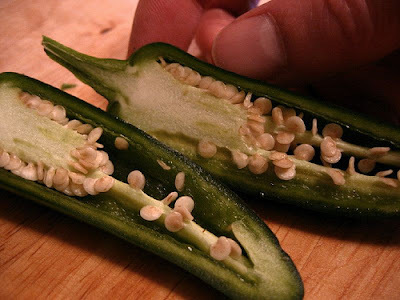 Note: One very important warning if you use fresh jalapeno peppers--be careful what you touch after chopping these guys up! Don’t touch your eyes (or for God’s sake any other highly sensitive body parts) unless you’ve first carefully scrubbed your hands. We will speak of this no more. Unfortunately my dear wife does not share my appreciation for this under utilized vegetable. 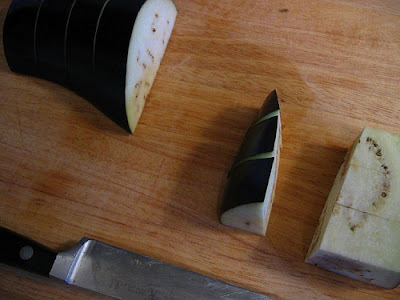 To make dinner more palatable (less bitter) remember to use fresh eggplant, smaller eggplants tend to be less bitter and male eggplants have fewer bitter seeds. Eggplants have a slight indentation at their base and the male plant’s indentation is less deep and rounded. The female indentation is deeper and elongated. 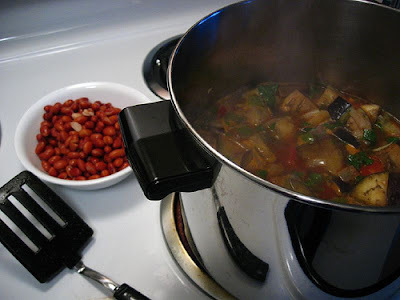 I bet you could substitute another vegetable for the eggplant... maybe a summer squash, cut into cubes? It would have a different taste and texture but it could work.